Let’s face it, we love our pets — and the statistics back it up. Approximately 44 percent of American households have one or more dogs and 35 percent have one or more cats. That translates to roughly 78 million well-loved dogs and 85 million well-loved cats, says the ASPCA. Just how much do we love them? According to Fortune magazine, we spent roughly $60 billion on our beloved fur babies last year. And while the highest percentage of that figure was spent on food and veterinary care, there is no denying we love to indulge our faithful companions. For example, they no longer go to “the kennel” when mommy and daddy go out of town. 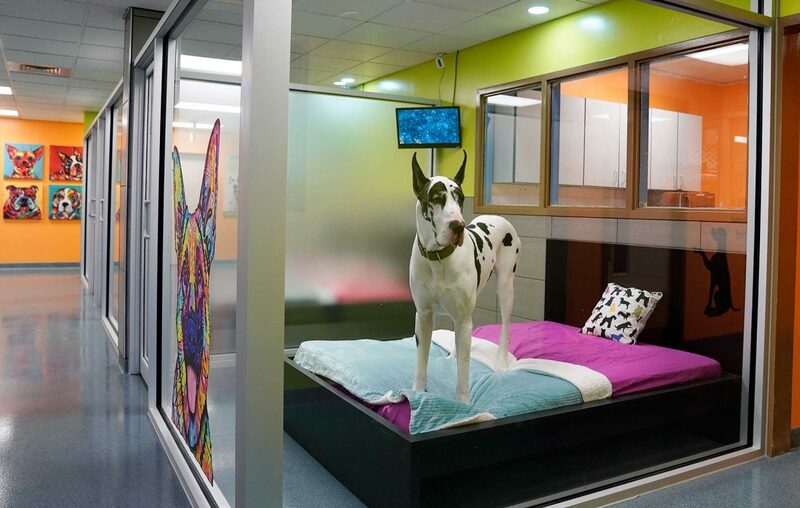 Instead they go to places like Creature Comforts Pet Resort, Camp Bow Wow, or Cara Mia Pet Resort (which dubs itself “WNY’s only country club for pets”), where the accommodations can rival those of a five-star human hotel. These pet palaces offer amenities like gourmet meals for finicky palettes, climate-controlled luxury suites, well-groomed outdoor play areas — even an indoor splash park and flat-screen TVs. Most also offer anxious pet parents the opportunity to check in on their pets via webcam or phone app. Daycare dogs socialize on the playground at Pawprints by Penny. Pet parks and doggie day care have become popular, too. Well-behaved dogs can go off leash at The Barkyard at LaSalle Park, the Paw Park in Amherst, Wilkeson Pointe Park in Buffalo or Knox Farm Estate Park in East Aurora, where they can interact with other dogs, play fetch with their human, enjoy a run in the sun (or snow), or relax in the shade. And rather than spending their days snoozing in a crate or on the living room couch waiting for their humans to return from work, Rover and Fido can enjoy cage-free daycare at Dog Days of Buffalo or Buffalo Barks, where organized playgroups match dogs by age, size and temperament. Dogs love the pool at Pawprints by Penny daycare. Want your pup buffed and puffed? There are many grooming salons where dogs — and cats — can get the royal spa treatment. In addition to a soothing aromatherapy bath, how about a hypoallergenic shampoo, ear cleaning, nail trim and teeth brushing. Want a green dog for St. Paddy’s Day or your best furry friend to match the colors you’ve chosen for your wedding day? No problem. Pawprints by Penny uses non-toxic coloring that is pet safe. There are even groomers, such as Lauren’s Lavish Pooches and Park ‘n Bark, who will pull right up in your driveway to pamper your pet. If you’d like to save some cash and groom and walk your own pooch, Animal Outfitters on Elmwood Avenue carries a full line of grooming, aromatherapy, dental care products and environmentally friendly poop bags and dispensers. And then there’s the bling. In addition to rhinestone collars and fur-lined coats, your pup can now sleep in a comfy, monogrammed bed, walk around with a shirt, bandanna, collar or leash promoting his (read: your) favorite sports team, and get decked out in tasteful holiday outfits. Creature Comforts Pet Resort also offers food, supplies, toys and pet accessories. And what’s the point of all that fuss if we can’t show off our beautiful babies? Good news: More than 60 local restaurants, including Lloyd Taco Factory, Betty’s, The Irishman and Ebenezer Ale House, welcome Fido at their outdoor patios. There are also many annual events you and your pet can attend, such as Dog Days of Kenmore, the Eastern Hills Mall Pet Expo, Paws in the Park and Wine and Wags. You and the pup can even take in a Bisons game during Dog Days at the Ballpark, or pose with Santa or the Easter Bunny at special events. And you know that phrase, “You can’t take it with you”? Well, that no longer applies to pets. Thanks to a law passed in 2016, it is now legal in New York State for the cremated remains of pets to be interred with their owners in state-regulated cemeteries – as long as the cemetery approves it. In Western New York, all four cemeteries owned by the Forest Lawn Group allow for domestic pet burials, as does Mt. Calvary. After all, pets are family, too.